Bus industry and business leaders will assemble in the House of Commons today to lobby government with a five-point plan to generate economic growth. 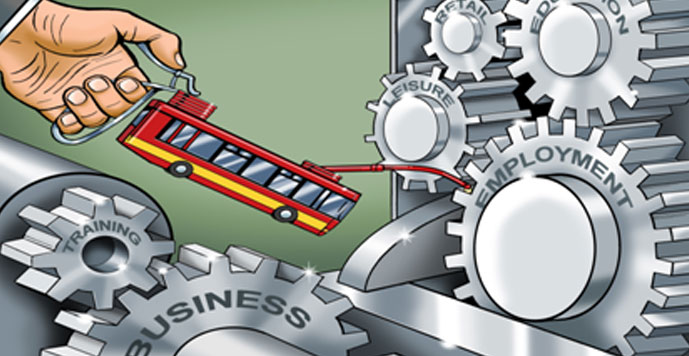 The importance of the bus to the UK economy, highlighted recently by an authoritative new report, will be presented to the House of Commons today in a new five point plan for growth . The Buses and Economic Growth report , undertaken by the Institute for Transport Studies at the University of Leeds, revealed that more people commute to work by bus than all other public transport combined; bus commuters generate over £64 billion of economic output and 400,000 people are in better more productive jobs as a result of the bus. “Buses are the mainstay of the public transport sector, carrying millions of passengers every day for business and leisure as well as helping to cut carbon by reducing congestion and replacing car journeys. And crucially, as this report highlights, buses are a keystone to the economy. “The Government has been exploring how the planning system can be better used to support economic development and regenerate the economy. At the same time, it’s vital to ensure the planning system delivers the right incentives for local authorities and developers to provide the right transport infrastructure and environment to support bus services which help underpin that growth. Greener Journeys will present its five-point plan for growth to MP’s at the House of Commons on Monday 17 September, 1530-1700. Transport Minister Norman Baker MP will give the keynote address. Copies of the report, Bus Policy: a five-point plan for growth by Greener Journeys are available on the Greener Journeys website: www.greenerjourneys.com from Monday 17 September. The Buses and Economic Growth report, conducted by the Institute for Transport Studies (ITS) at the University of Leeds has quantified an assessment of the economic contribution of the bus in growing the economy, connecting people with jobs, helping businesses and supporting the vitality of city centres. It also highlights the significant direct contribution of the bus industry itself in creating employment and investment. Greener Journeys is a campaign dedicated to encouraging people to make sustainable transport choices. It is a coalition ofBritain’s leading bus companies and other public transport supporters, including the Confederation for Passenger Transport, PTEG, the RAC Foundation and Transport forLondon. Its primary funders are bus companies (Arriva, FirstGroup, Go-Ahead and Stagecoach). 1.2 To provide adequate revenue funding in addition to capital funding streams to enable the ‘full bus package’ to be implemented. 1.3 To conduct joined-up thinking across different government departments on the role of the bus in helping the economy (e.g. DfT, HM Treasury, BIS, DWP, DfE, DCLG and DoH). 1.4 Planning decisions on new developments to consider fully the critical role of public transport in giving employers access to a wide and diverse labour market and giving people access to jobs.